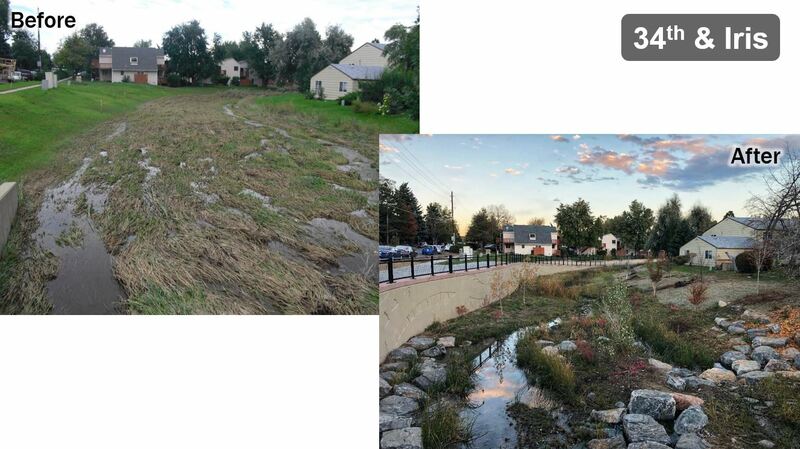 Over the course of the past 10 years, the Urban Drainage and Flood Control District (District) worked with the City of Boulder (City) to plan, design, and construct a major flood control and regional trail project along a one mile stretch of Wonderland Creek from Foothills Parkway to Winding Trail Drive. The project reduced the 100-year floodplain such that 450 individual multifamily dwelling units were no longer in the 100-year floodplain at the end of the project. 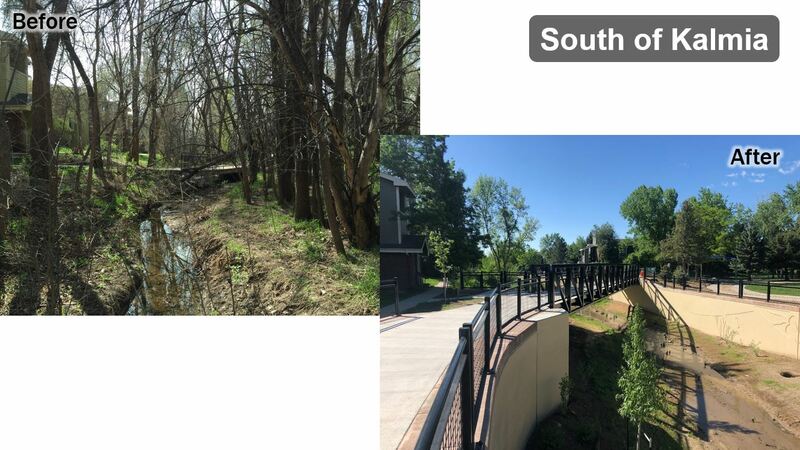 The project also built a new regional trail along the entire project length, with new trail underpasses at a railroad crossing and at two road crossings. The District contributed around $2.6 million towards this $30 million project. 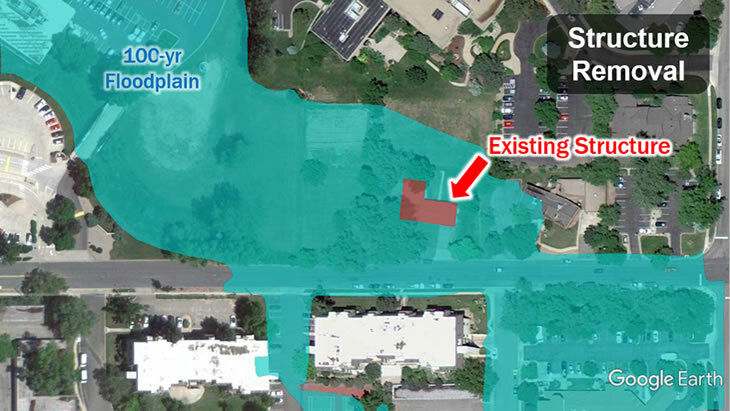 This area of Boulder was impacted during the 2013 flood with many structures inundated, and at one location near 28th Street a woman nearly drowned. 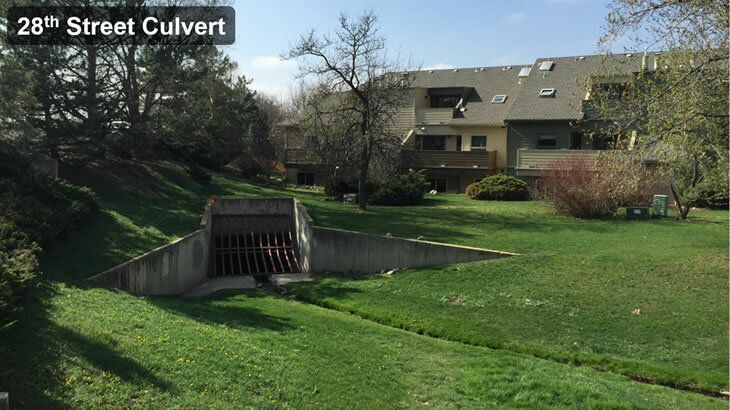 She was living in a garden level apartment near the box culvert that carries floodwater under 28th Street. A trash rack at the box culvert entrance clogged during the flood, sending excess water into her apartment through her back door. As the floodwaters rose she actually didn’t wake up until her bed was floating around the bedroom in over three feet of water. Floodwater was coming in through the back door and was pushing the front door shut, and she was in danger of being trapped. Some neighbors were luckily able to get in and help her escape. As they helped her get out, she was screaming for them to go back in and save her dog, but they were afraid they would get trapped in the apartment themselves, because the floodwaters were rising and pushing hard against the front door, keeping it shut. Luckily for the dog, they came back the next day and it was safe and sound floating around the room on top of that mattress. 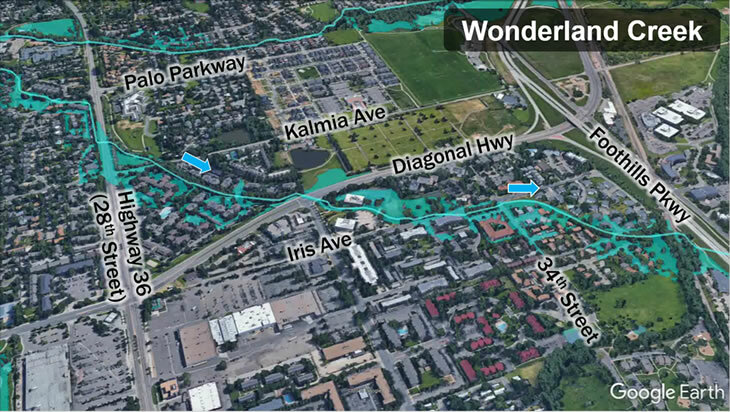 Make no mistake, the flood risk along Wonderland Creek was very real. The project had a lot of challenging constraints, including a crossing of the Burlington Northern and Santa Fe (BNSF) railroad. In fact we had to pay the BNSF railroad to build us a new bridge on their tracks so the 100-year flood could pass under the tracks instead of over the tracks. 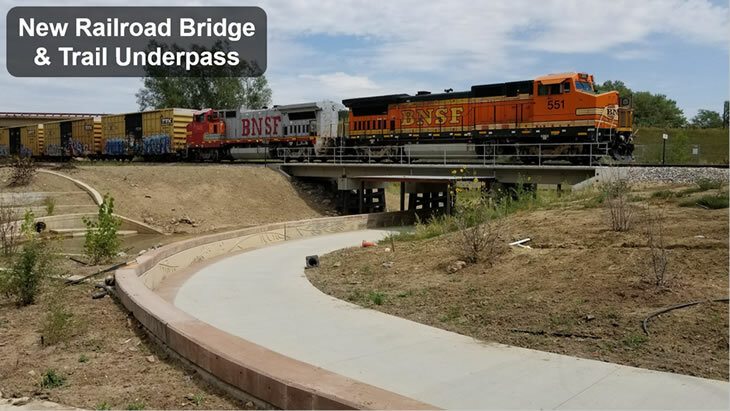 The new bridge also included a new trail underpass, eliminating a significant safety hazard because people had been injured illegally crossing the tracks. It took around six years of coordination to get the railroad to show up and build the bridge, even though it was a project cost and not a BNSF cost. We also had to relocate and reconstruct the Boulder and White Rock Ditch (BWR Ditch) which introduced another coordination challenge, as ditch companies can be notoriously difficult to work with. We also had to obtain over 50 different easements from over two dozen different property owners including one particular property where we had to purchase a single family home, in fee, simply so we could demolish it. It was located right next to the creek and was at such a great flood risk it had to be removed to make room for the project. 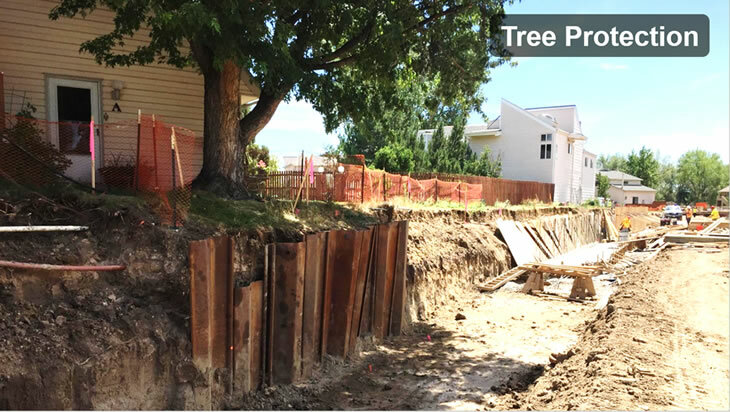 The project went to great lengths to save mature trees wherever possible, including in this photo where we drove sheet pile to protect the tree roots. 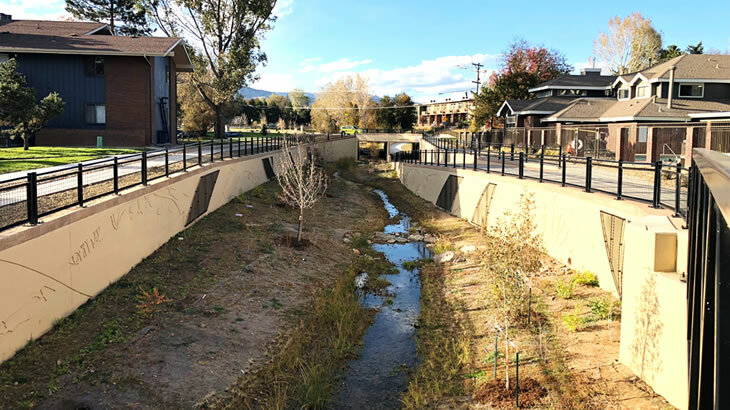 In order to confine flood flows to the creek corridor, rather than letting them flow through the adjacent neighborhoods, we had to create more cross sectional area along the creek itself. To do that the creek could’ve been excavated wider, or deeper, or some combination of the two. Many areas of the project had so little room to convey the flood that we were left with no choice but to dig the creek deeper, which necessitated walls in order to achieve the enough cross-sectional area to pass the flood flows. With so many apartment buildings on either side of the creek there was simply no room to widen the creek. Unfortunately this also meant that hundreds of trees had to be cut down to deepen the creek. Here are photos of one such location showing the tree removal and some of the top-down wall construction we used to avoid damage to the adjacent buildings. 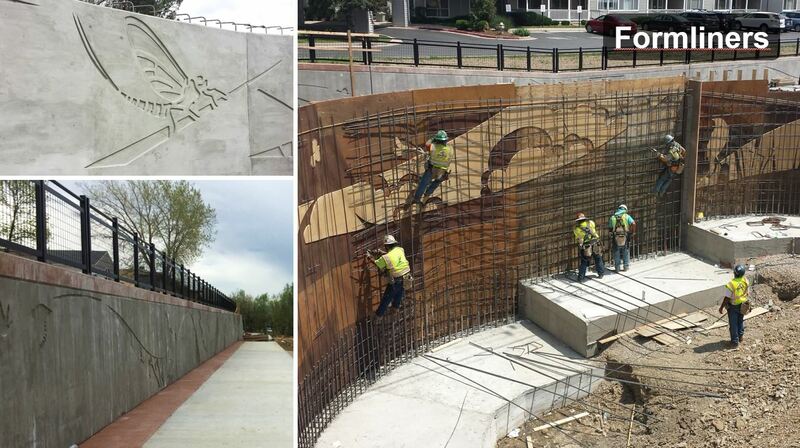 Here are some after pictures that show the new walled section of creek and the new underpass of Kalmia Avenue. Because the project needed thousands of feet of walls we hired an artist to create custom form liners to improve the aesthetics of the walls. The artist created designs that were imprinted into the concrete as they were cast in place. Using cast in place concrete created the opportunity to beautify the walls with the custom form liners, but it also meant the artist and the structural engineer had to work together to make sure the art impressions weren’t so deep as to threaten structural integrity. Construction traffic control was extremely challenging. This photo at 34th and Iris shows how we had to completely close the intersection during construction. This created quite a traffic challenge because this intersection was the only way in and out of a neighborhood of around 700 to 800 multifamily homes. We were forced to open up a fire access lane in an adjacent multifamily community to daily traffic, and unfortunately this was through a neighborhood that didn’t directly benefit from the project, creating public relations challenges. Here’s a photo of construction traffic control and construction phasing at the crossing of 28th Street. 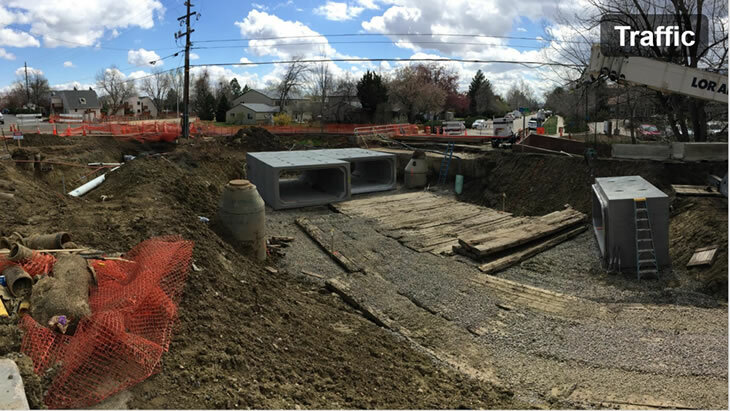 We were unable to completely close 28th Street, which meant the new large culvert we were building across the road had to be built one half at a time. This necessitated an elaborate shoring system to protect the excavation below and the traffic above, as you can see here. Now let’s look at some before-and-after photos. This is a before and after photo of that same location at 28th Street. 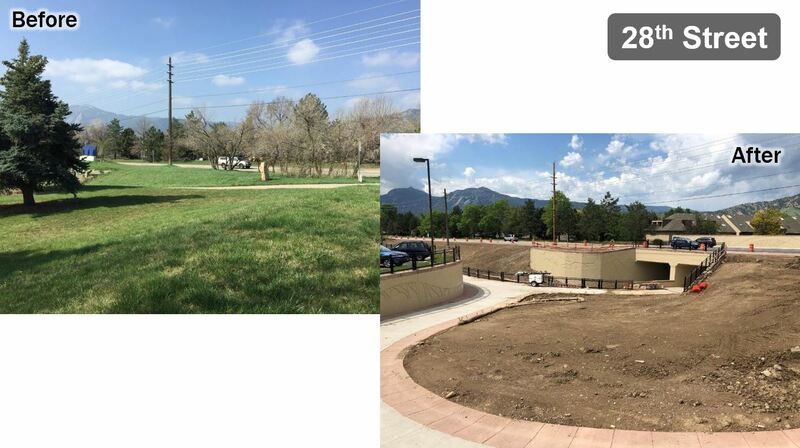 You can see the new culvert and trail underpass that we built with the project. Further downstream is the Kalmia Avenue crossing. 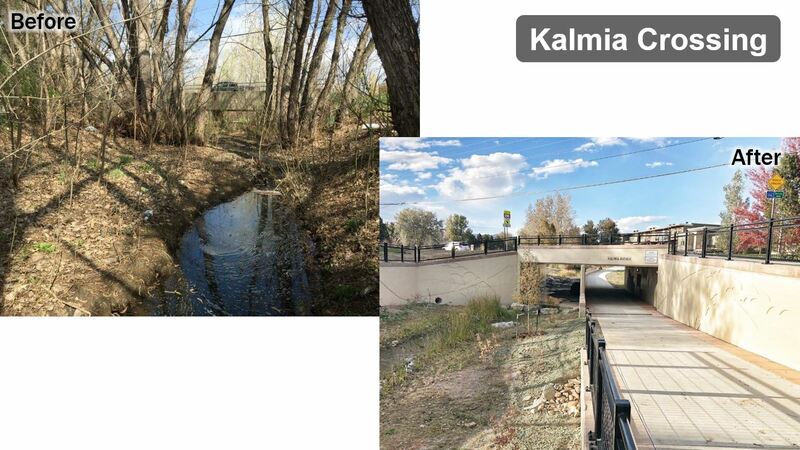 The before photo shows the smaller creek and all the trees, and the after photo shows the lowered creek in the walled section, with the new trail underpass of Kalmia Avenue. Further south of Kalmia you can see in the before photo there used to be a trail and bridge down low by the creek. 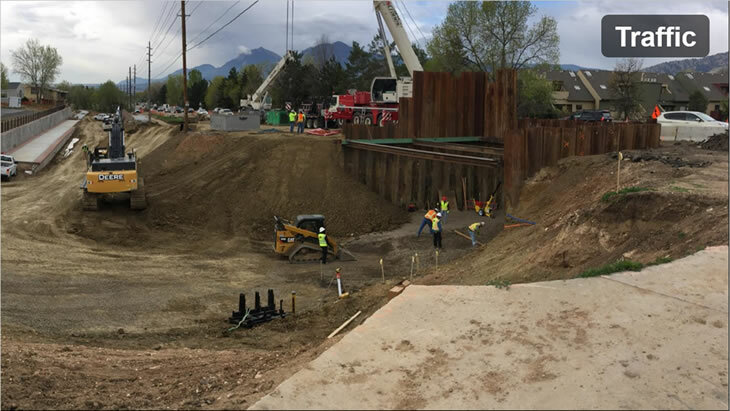 With the goal of passing the 100-year flood we had to build a walled section, so the new pedestrian bridge had to be elevated to span the creek from wall-to-wall. This next series of photos is down along Iris Avenue near where we had to purchase and demolish that single-family residence. This is actually near where the Bolder Boulder used to start many years ago before it was moved near the 29th Street Mall. 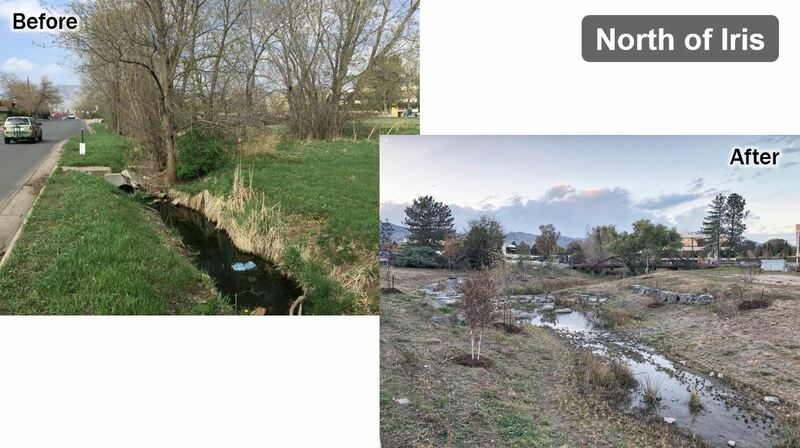 The before photo shows a creek that was perhaps two feet wide, and the after photo shows the deepened and widened creek, with a boulder drop structure providing stability. 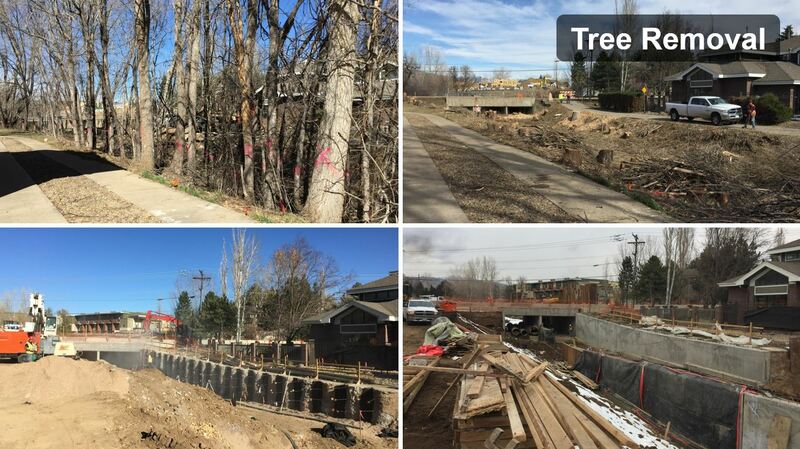 Here are the before-and-after photos southeast of 34th and Iris. 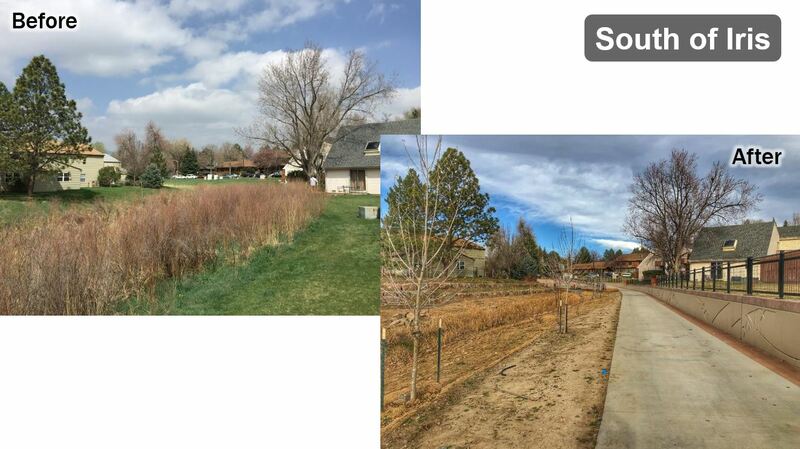 The before photo is actually from the days following the 2013 flood. You can see the new walls we had to build to support the new trail and to get enough cross sectional area to pass the flood within the creek corridor. As we get south of Iris in this before-and-after photo you can see more of the new trail corridor and the tall mature tree we protected next to the building on the right. 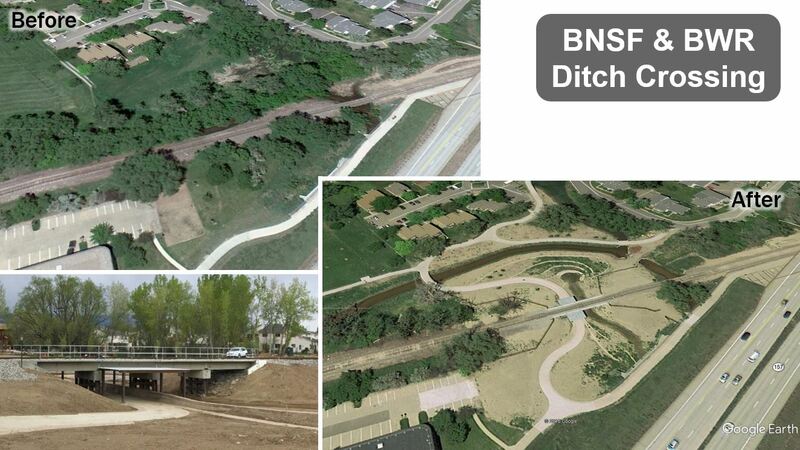 In this before-and-after photo down by the BNSF railroad tracks and the BWR Ditch you can see where we completely relocated the ditch, and where the BNSF came and built a new railroad bridge that allowed for the new trail underpass. Note the series of curved walls that are visible between the railroad and the ditch – these walls serve as a spillway to convey flood flows from the creek to the new railroad bridge and under the tracks. The after photo was prior to the site fully revegetating. Lastly, here’s what it looks like west of 28th Street where I told the story of the woman whose home flooded in 2013 and she nearly drowned. 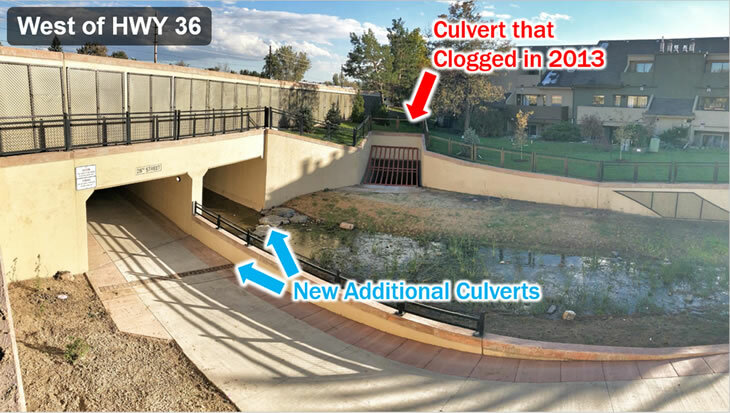 Here you can see the two new culverts we built across 28th Street to reduce flood risk and to provide a trail underpass. As a result of this project, it will take a lot bigger flood than 2013 to flood her building again.